Lobsters are expensive. But they are also tasty, and as an added bonus you get more "stuff" out of them. I almost always use the carcasses to make stock and butter. Unless, of course, there's been a glut of lobster eating this year and my freezer is already full. This is a basic stock. Lobsters, Veg (carrots, celery, onions), pepper corns, some thyme. 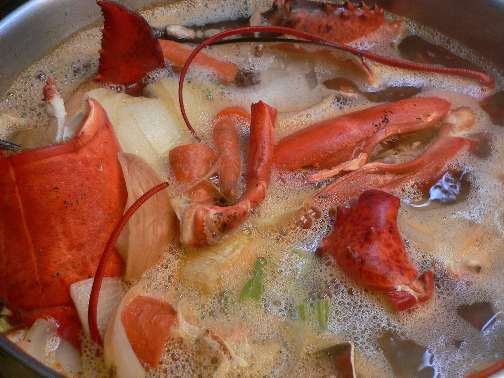 I make the lobster stock basic, but later can add cooked rice, more variety of veg, and whirl down into a bisque very quickly. After about an hour, any meat/bits/tasty parts have falled out of the shells, and so I fish out all of the shells except the crusher claws (They are too hard for butter making). 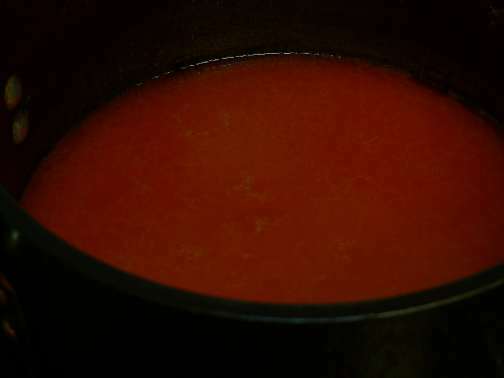 I let the stock continue to cook for another hour, then strain and reduce by half. I almost always reduce stocks that I'm going to freeze. 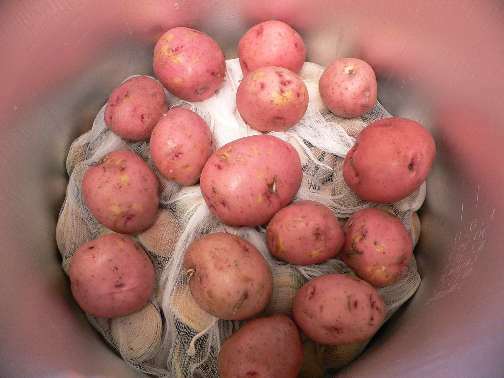 Take up less room in the freezer, and less time when it comes to use them. I got just under 4 quarts out of this batch. Now for the "fun" part. As Derrick says, lobster butter is probably one of the more creative uses of kitchen equiptment. Take your lobster shells, whack them up as best you can (rolling pin), and place them in your Kitchenaid with the paddle attachment. Add butter (in this case, two pounds of Sweet Sweet Plugra). 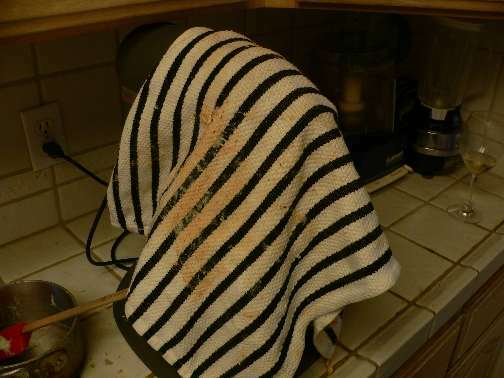 Cover the entire operation with the towel, and turn on the lowest setting. Rejoice! As bits of lobster and butter and butter coated lobster try to leap out of the mixer. Keep an eye on the mixer, you may need to halt it if it jams. Eventually, things should settle down, keep grinding away until the bits don't seem to get any smaller. 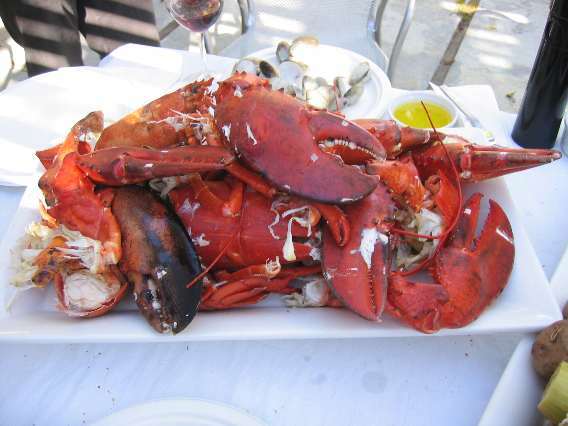 With larger lobsters, the pieces never do break down entirely. However, with 1.5 pounders, you usually end up with very small bits. Oh yeah, and did I mention one unholy mess as well? Notice that we've got butter on the towel, the outside of the mixer, the counter, and even up into the gearworks of the mixer. Scrape out all of the parts and bits into some sort of oven-safe cooking vessel (I use a stock pot). Start on top of the stove over medium-low heat until the butter has melted. Transfer to a 200-225 oven, and cook for 40 minutes. Check the oven from time to time. You want nothing higher than a low simmer. 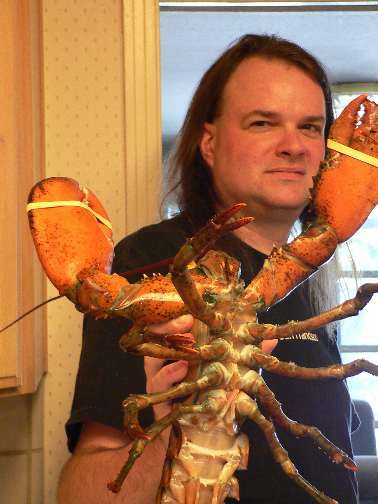 Now, how are you going to get that lobster away from that butter? Add water to the pot -- about an equal amount to the amount of butter. 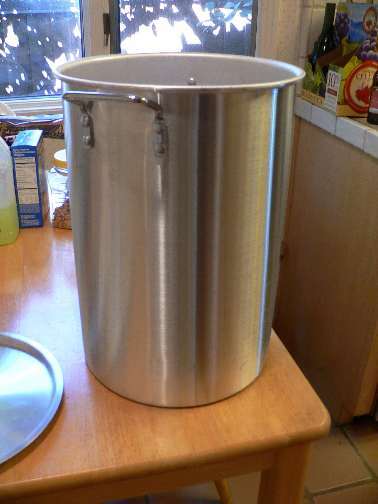 Return the pot to the stove and heat until you are sure everything is still plenty liquid. Then, strain the mixture through a fine sieve. If you don't have a chinois then I recommend a coarse strainer followed by a fine mesh one. 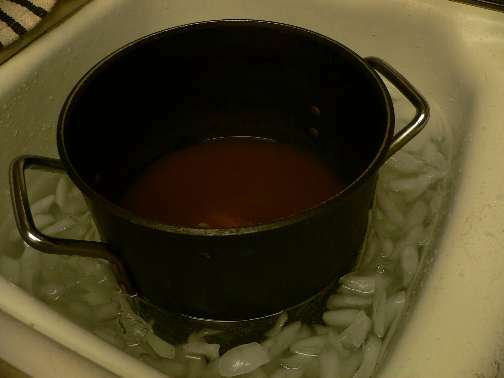 Return the strained liquid to the pot. I usually clean the sieve at this point and pass the mixture through one final time to make sure I got out any shell bits. 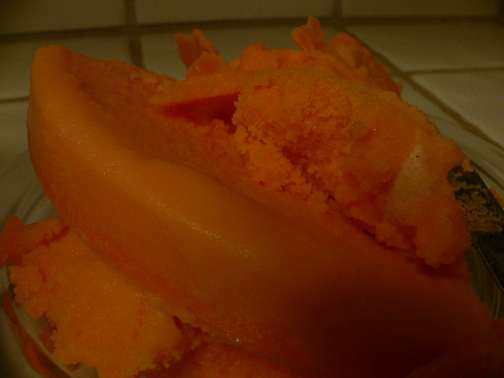 Once strained, the bright orange color of the butter really shows up. Place the pot into the fridge overnight. The butter fat will rise to the top and solidify while the water-based liquid will be at the bottom and remain a liquid. 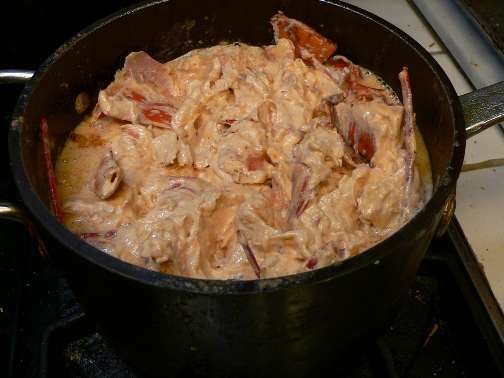 Using a spoon, lift and/or scrape the fat from the liquid. Dry off the bottom. And there you have it. Lobster butter. Well, technically, this would be lobster flavored butterfat. The process of separating the fat from the liquid has also removed the natural emulsifiers from the butter. 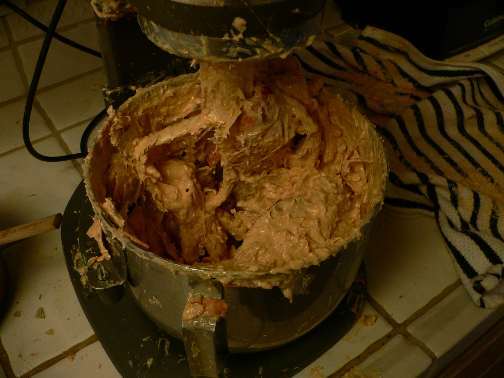 As a result of this, you cannot use this in preparations that make use of this emulsifing nature of butter (such as beurre blanc, or, uh, lobster butter cream). You can, however, mount the butter into sauces that have otherwised reduced. It also makes a great stir-in at the end of cooking risotto. 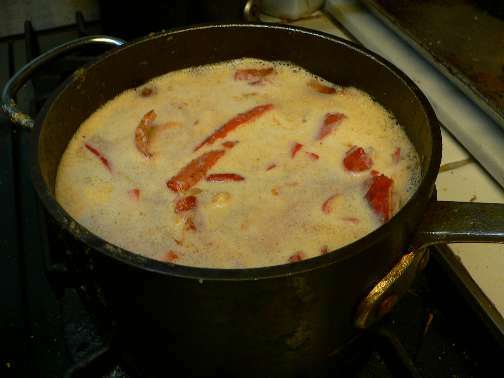 The cannonical use of lobster butter, however, is as a final stir-in when making lobster bisque. 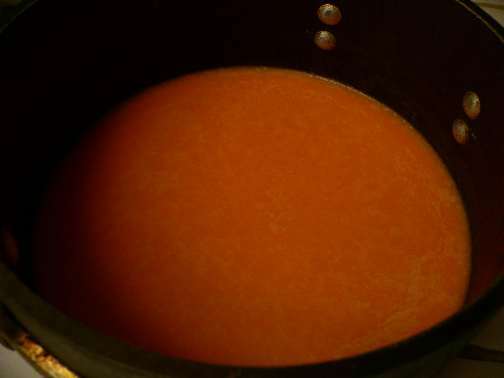 It is lobster butter, and not tomatos, that gives bisque the unique orange color. Well, if you make it correctly, that is. Wrap well in plastic and freeze. Eat local? How about something I grew myself! 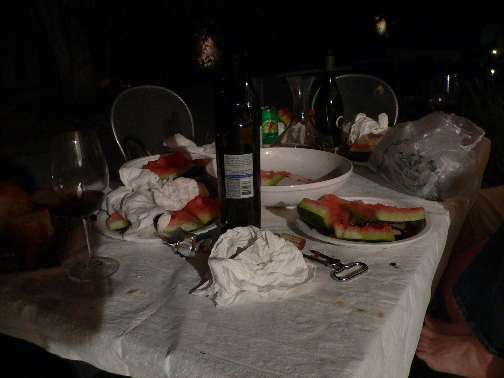 The watermelon wasn't the best I've ever had, but it certainly was tasty. After all of that rich food, a nice cooling fruit is about what you need. 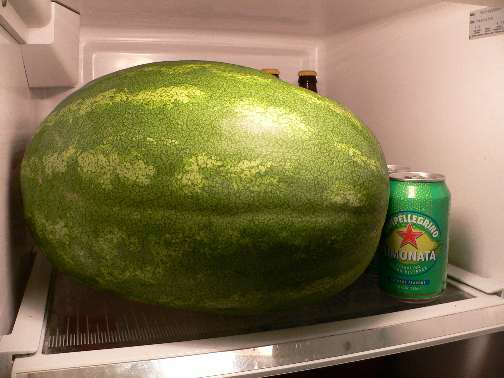 It was a big one and (as they like to say in the fruit business) "heavy for its size." Of course, as an added bonus, there are lots of seeds to spit into the bushes. Maybe next year there will be more watermelons? 2 pm to 2 am. Good thing it wasn't a school night. Did I mention there was some wine? When the legs are loose, the lobsters are ready! It took two people to undo the clams. Let me tell you, that steam was hot! The table is set. Did I mention we had some wine? We probably should have cleaned off those corn husks, but honestly I'm not sure anyone really noticed. Oh, I guess we need to eat these, too. There was none left. Burp. Lobsters don't feel pain. However, they are certainly very tricky to deal with while still alive. I don't like to cook them with the bands on their claws (who likes to eat rubber? ), and the last thing you want is a massive crusher claw grabbing onto your thumb. 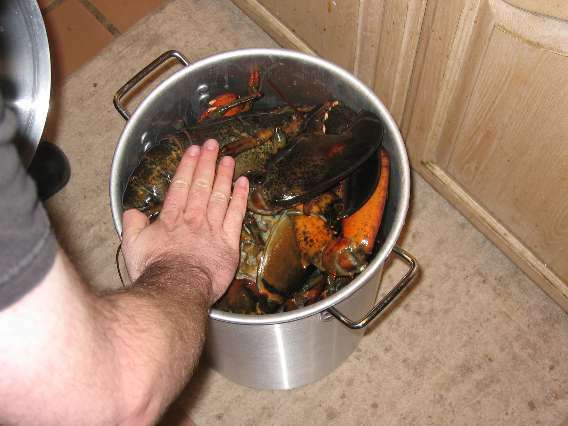 For lobsters of this size, even the small claws can give you such a pinch. 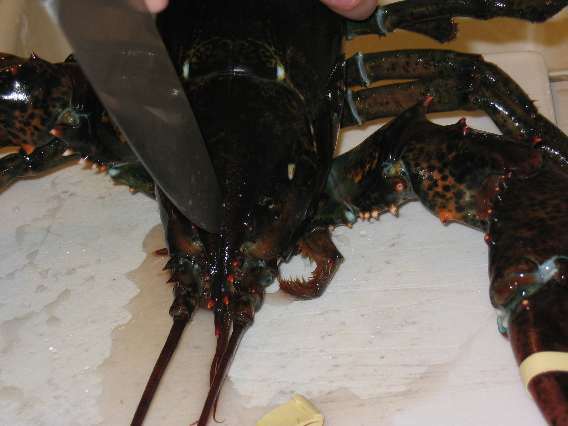 The quickest way to kill a lobster is to drive your chef's knife straight down into the line between the eyes and then lever forward. When you do this, make sure you have a strong grip on the tail. And keep your other hand away from the knife! If indeed, "Lobster is my friend", why did I just do this to them? Okay, so that's a heck of a display. 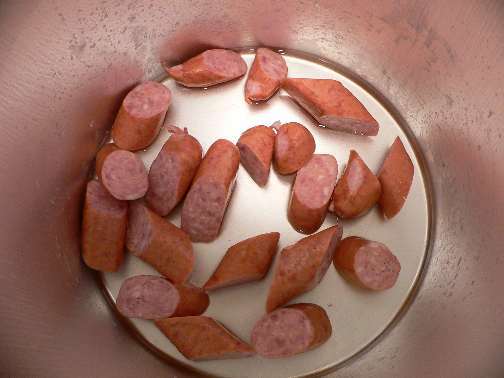 I had no good way to know how many would fit in the pot. 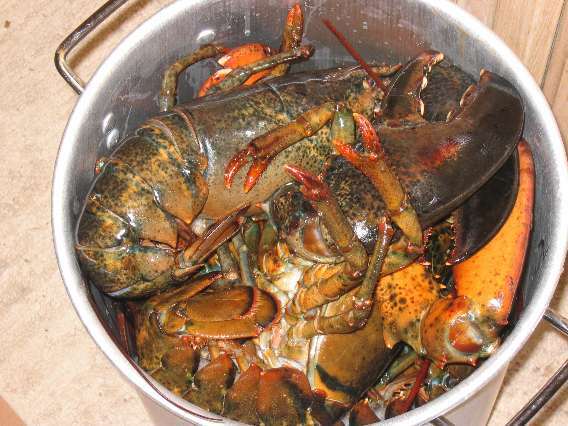 So, I get to have lobster for dinner this week as well! Here's a size comparison between my own hand, and that of the lobster. The white portion of the crusher claw looked like teeth. Yowch! First, get your largest pot. 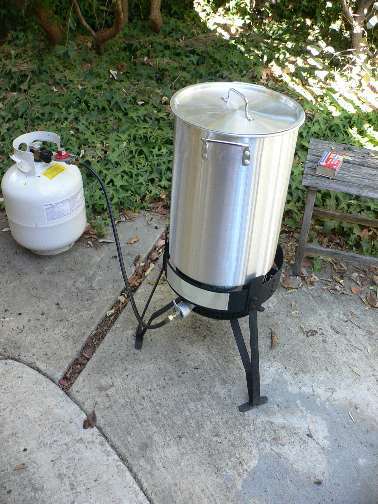 This is a massive one intended for deep frying turkeys. 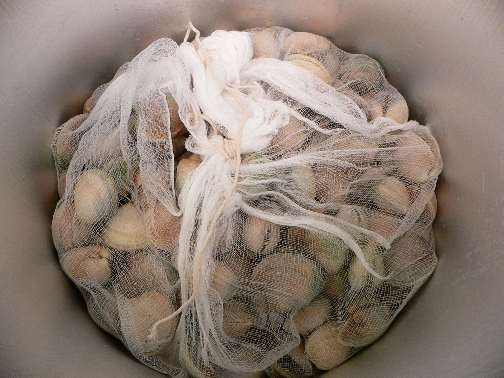 I've never done that (yet) but it also works great for clam bakes or crab boils. You'll be layering the ingredients. I added about 1/4 C of white wine and a bit of water. This was just to make sure we had enough steam. 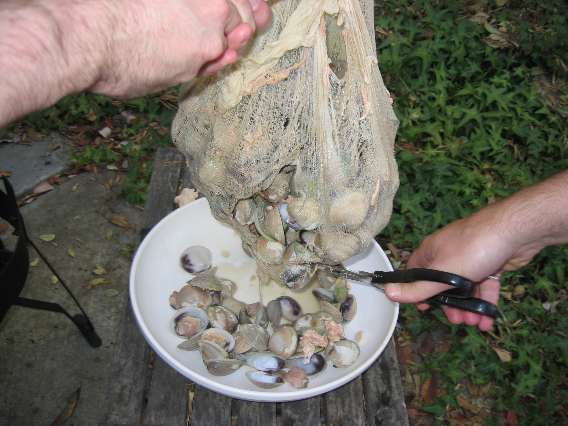 The cheesecloth makes it easier to take the clams out. Technically these were New Zealand Cockles and not clams. We've had quite a bit of red-tide in the states recently. anne claims that these are just "filler." But they did turn out good. Not the best time of year for corn. 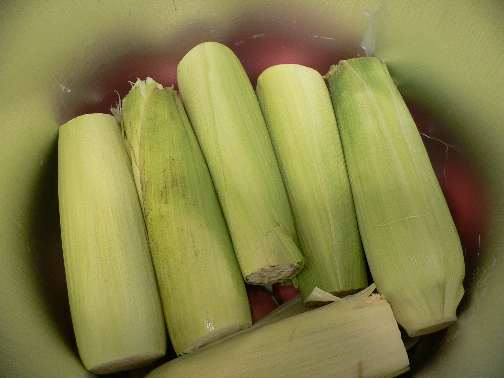 Leave the husks on so that the "lobster foam" that will come out won't be directly on the corn. We could only fit four of the lobsters in. 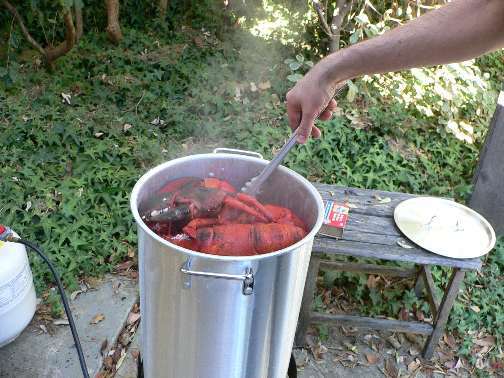 Cover and cook over medium heat (such that steam is coming out) until lobsters are done. For these 4 pounders, that ment about 30 minutes. I yank on the small legs to see if the lobsters are done, when they are loose, it's time for eatin'! Why is it called a clambake? You aren't baking anything. And all most people talk about are the lobsters. And let me tell you, large lobsters are pretty neat. 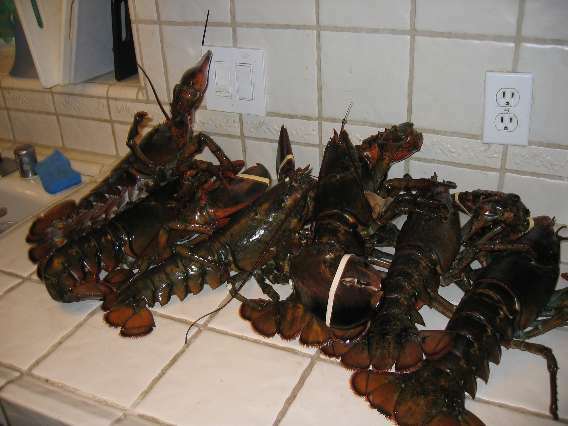 These guys were nice and feisty -- this is always a good sign with lobsters because you know they are healthy. More on the clam bake in the upcoming days. I'll just say that it turned out very well. Not exactly sure just how it snuck up on me like this, but Julie Powell's Book is finally out. A link to the blog for the Julie/Julia Project is on the lefthand side. I've been told by others that the book reads better, no doubt the result of editing. Obviously I have mine on order! 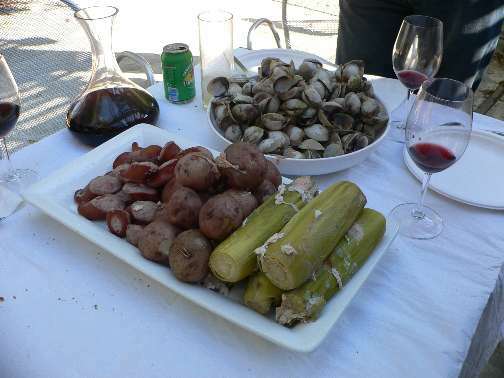 And just to prove that I haven't fallen completely off the face of the earth -- this weekend will feature a massive Clambake! Pictures and details to follow.